Summary: In this final installment of the Tankborn series, Kayla has been kidnapped by the group that has been bombing GEN warehouses, and she must pretend to sympathize with them in order to escape. In the wake of a devastating bomb blast, severely injured Kayla has been brought to the headquarters of the organization that planted the bomb-and many others like it in GEN food warehouses and homes. Her biological mother tells her that Devak is dead and that Kayla must join her in the terrorist group, which is ramping up for something big. Now Kayla must pretend that she embraces this new role in an underground compound full of paranoia as she plots a way to escape and save her friends. Meanwhile, Devak has emerged from his healing in a gen-tank, only to be told that Kayla is dead and his family has fallen from grace. Can he overcome his grief at the loss of his power to see the clues that point to Kayla being alive? As Kayla and Devak overcome the multiple obstacles put between them while trying to free GENs without further bloodshed, the Tankborn trilogy rushes to a thrilling conclusion! Review: Being the third and concluding book of a series about teenagers working to over throw a system of oppression, I expected Rebellion to be about the big battles of a revolution, but instead it is more of a story about two people fighting for their love against the individuals who wish to keep them apart. I was quite surprised that the ending of the Tankborn series was actually not about a global revolution but a personal fight for freedom; the ability to make one’s own choices. 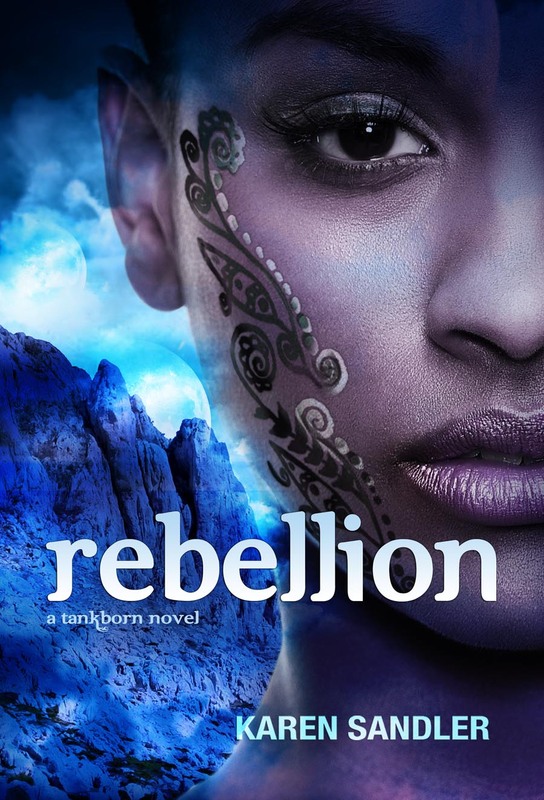 At first I wasn’t sure how I felt about it, but as I continued to read and get more involved with Kayla’s and Devak’s struggle, I enjoyed the change from a “rebel against society” to a personal rebellion. Both Kayla and Devak have been manipulated by two different factions, the FHE and the Kinship respectively, who want to use the teens for their own means. Instead, because both Kayla and Devak are smart, neither really trust what they’ve been told and set out to discover the truth. This sets in motion the personal rebellion by each to find the other. This key change, this personal struggle for freedom, made me really enjoy Sandler’s novel. In a landscape of books about teens challenging and winning against an corrupt government, to have two young people who just want to be together and work hard to achieve that goal was refreshing. Sandler doesn’t make the journey easy for both Kayla and Devak and both experience setbacks in their search. Maybe I’m sick and like to see characters suffer, but if the journey to find each other had been to easy (as the love story is in some books) then the pay off would not have been worth it. Through the first two books Kayla and Devak learned that rebellion against society is hard and comes with a price, and in Rebellion, both learn that the same costs come with fighting for one’s own freedom. Both experience some losses, but their determination to be free from the organizations who wish to use them and be able to love each other, is what keeps them fighting. I loved that aspect of both of their characterizations and it felt realistic. It took them two books to realize how much they love each other and in this book, they were willing to do something about it. I really loved this aspect of the story and rooted for Kayla’s and Devak’s happy ending. Like the other two books, Sandler’s world is just as engrossing as ever. In Rebellion, the story takes on a broader scope and we travel with Devak, and Kayla to a certain extent, to the outer areas of Svarga and even spend some time in the Badlands. The way Sandler writes her world, it feels so real, that when I was done reading I wasn’t ready to leave Kayla and Devak. In fact, I’m hoping that Sandler is willing to write a fourth book, or even another book set in this unique world. The way she describes Svarga, including all the little details, makes me imagine that Kayla’s & Devak’s world actually exists somewhere in this wide universe of ours. Recommendation: If you haven’t read the series, go buy it and if you’re anxiously awaiting Rebellion – get it as soon as it comes out. P.S. I just adore the cover. I could stare at it all day. It’s just that beautiful.